When you first start out in the photography business, blogging might be way in the back of your mind. I can tell you that for the longest time I tried to stay away from blogging. I honestly thought I would hate it! I thought that it was a waste of time, why blog? 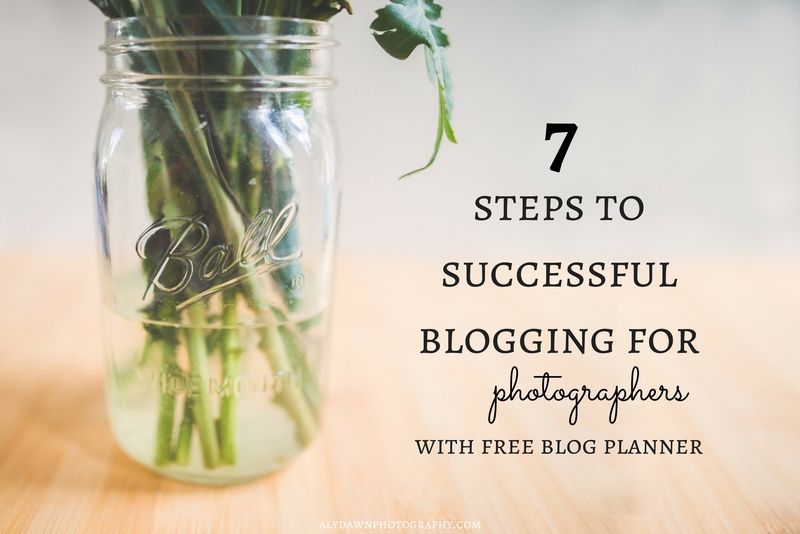 When you start your photography business, there’s so many things you have to focus on, so sometimes it’s easier to just forget about the blogging side of the business. But I am here to tell you that you shouldn’t. Blogging is extremely important to any business. 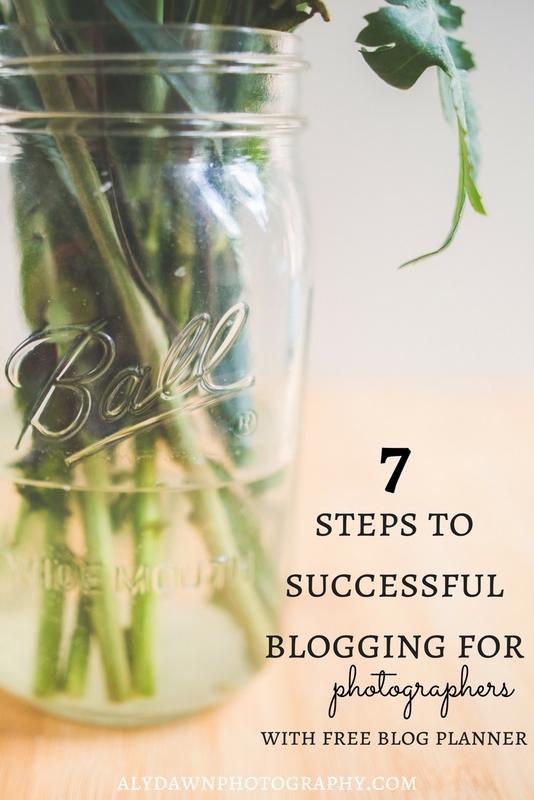 Keep reading for 7 steps to successful blogging. I started my photography blog in hopes to get more clients for my photography business. I wasn’t ready to start a photography business. I didn’t have a portfolio. I really wasn’t very good at photography, either! But I had high hopes. My blog has taken a different approach since that initial start. I now know my why to blogging. I think it is important for you to figure out your why. Why do you want to blog? With blogging you’re able to write down your thoughts, ideas, and insights in how you work. You’re able to show what you do, why you do it, and how your audience can achieve the same effect. For a photography blog, this is extremely important. I know I’ve gone to countless photography websites where I wish I could get some insight into how they achieved that image! If I had just an inkling of an idea, I would be able to experiment and explore my own style of photography easier. It helps optimize your SEO – it helps search engines find you, and who doesn’t want to be found? You can grow your email list and get more customers that way. It gives your talent and business credibility. It helps you compete with the competitors – yes, they’re blogging and so should you! I believe this is something I have struggles with. I think it’s important to explore different things and to figure out what works for you. But once you figure out what works for you, keep it consistent. Keep your work consistent, too. When writing your post, keep the format the same. In all of my posts I have an introduction, I write words about the post, then I dive right in to my points (if it’s a list post, like this post is), I always have at least one image. This helps my readers to know what to expect. They can look at my format and automatically know that it’s my site and not anyone else’s site. Consistency will help you get more readers to come to your blog over and over again. This will help you be successful in your blogging. If you have a photography blog, but are blogging about how being a mom is hard…that doesn’t really fit into your target audience. Same goes for if you have a photography business and the reason for blogging is to get more clients. You don’t want to blog about how you saved money that month. That will get a different set of eyes than what you are after. Instead, you want to blog about all of your client sessions. Showing potential clients what a session is like with you. For me, my target audience are beginner bloggers & photographers who want to learn more and increase their knowledge. Figure out what will work for you in the beginning. Make a schedule. How often will you blog? This goes along with being consistent. Will you post twice a month? Twice a week? Write down how often you will blog and try to keep at it. By being consistent with your schedule, your audience will know how often you update your blog. It’s no fun going to one of your favorite blogs and finding out they haven’t had any new material in over a year. Keep your audience excited to come back to your blog by posting regularly. Social media is growing! If you are not on all the popular social media sites, get on them now. My favorites are Pinterest & Instagram! Work on building your audience on there, and eventually it will pay off by linking your blog posts to those. Share your blog posts on any of the other platforms, too, like Facebook, Google +, & Twitter. Google + is an excellent one to have because it is directly related to Google, and who doesn’t want their blog posts to reach more people on Google, right? The more you post, the more successful you are. When I first started blogging, I tried to be like all the other bloggers I saw out there. They ALL had beautiful and bright photos. And when I tried to do that for myself, I found myself hating my posts. I hated the images that went along with that post, too! When I switched back to being myself, I became more successful. I was able to blog about the things I loved and I was able to share the images that really spoke to me. I think we sometimes forget how important it is to be ourselves. Part of being interesting is being unique. Have you ever stumbled on a blog that had so many errors it hurt to read? Obviously, bloggers aren’t perfect. But, if you are blogging, PLEASE make sure you try your best at proper grammar! That will help get readers to come back again. Readability on your blog is so important, I highly recommend the Yoast SEO plugin on your site. I am actually using it right now! It helps you with how readable your post is and how to make it better for SEO purposes. This plugin is essential and will help you become a more successful blogger in no time. Once I started planning out my posts using my planner, I was able to stay consistent and was therefore more successful. Luckily for you I have created a planner, free of charge! This planner includes a post page and a weekly planner. Print as many as you want out and put them in a binder. Fill them out and get organized. Staying organized will help you take charge of your blog and be a successful blogger in no time. Click here to download your FREE blog planner!